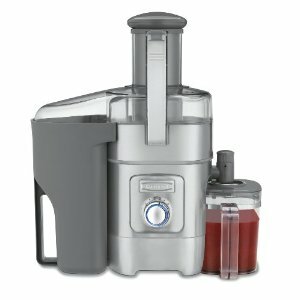 Another high-speed centrifugal juicer, this one from the well-known Cuisinart kitchen appliance people. The Cuisinart CJE-1000 5 Speed Juice Extractor features a die-cast and stainless steel body and a powerful, high-speed 1000 watt motor. The 5-speed control selects various spin speeds for differing fruit and vegetables – soft through to hard. The juicer carries a 3 year manufacturer’s warranty. Unless you have a sizeable place to tuck this Cuisinart juicer away you’re going to have to clear some decent countertop space to give it a home. Measuring 15 x 11 1/2 x 19 inches, it weighs in at 9 pounds which is not overly heavy but its bulk doesn’t make it too easy to keep moving about. That said, it’s a clean design, not unpleasant to keep on view and its stainless finish will fit with other appliances. I like that the feed tube is 3 inches in diameter too. It’s large enough to feed whole fruit and vegetables. On one side of the machine sits a 1 liter juice pitcher and on the other the 2 liter pulp container. A blue LED light surrounds the start switch . Don’t ask but it looks pretty ! Given that the Cuisinart juice extractor is a high speed machine it goes about its business surprisingly quietly. The 5 stage speed control allows you to select varying speeds ranging between 7000 rpm and 13000 rpm. The slower speed is used for soft fruits (grapes, tomatoes and peaches for example) and the highest speed for harder fruit (apples, carrots). There are no cutting knives built into this model. You’re going to have to press harder on the food plunger to push the hard fruits through. Several consumers who bought the Cuisinart have expressed disappointment with the amount of juice extracted. Like this comment on Amazon from Lorne Bourdo. The 3 inch feeder tube is a boon. just pop whole fruit in without having to prepare in advance and stuff portions into a small hole. There’s an adjustable flow, anti-drip juice spout to save messy, sticky worktops. 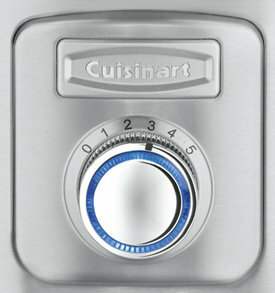 The Cuisinart’s unlock and lift system makes it easy to open and disassemble. Large pulp container makes pulp disposal easy. Components can be hand washed with the supplied brush although it can be fiddly getting into all the corners. Otherwise, pop it into the dishwasher. All parts are dishwasher safe. This machine won’t be giving as much juice from produce as the Breville 800 juicer as it doesn’t benefit from the cutting disk and 115 dual-action knives of the Breville. As with all high-speed centrifugal machines there will be more foam produced but this can be filtered off with the specially design foam filter disk so your resulting juice is going be clear, fresh and foam-free. The Cuisinart CJE-100 is around half the price of the Breville 800JEXL and Omega J8006 juicers which makes it good value for money particularly coming from a leading appliance manufacturer with their 3 year guarantee. It does have some nice features but lacks some of the better juicing abilities of the others. Design and Dimensions: Powerful, solidly built machine. Clean and smart but its large size needs a dedicated counter space. However, if you’re a compulsive juicer it’ll need to be ready for instant action. Performance and Noise: Large feed tube simplifies loading making it quick to use. Juice extraction is not going to be as effective as more expensive alternatives. Noise levels are low meaning that the whole household won’t be abruptly awakened by sounds of your juicing activities! Cleaning: Relatively easy. Clip open, dismantle and wash – either by hand or by dishwasher. 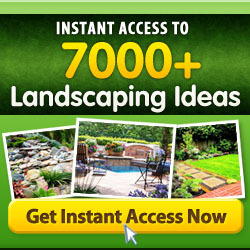 Cost: Good value for the money and includes free shipping. The Omega J8006 Nutrition Center Commercial Masticating Juicer really is a robust juicing machine. With its 17 pound bulk and powerful motor it’s capable of speedily chewing through fruit and vegetables, thoroughly extracting all the good stuff and turning out high volumes of juice. It carries an amazing 15 year warranty so that gives long-term peace of mind. You rarely come across warranties of that length and it’s certainly much longer than the 3 year warranty offered on the Breville 800JEXL Juice Fountain Elite, But as always it’s a case of horses for courses and it’s all about deciding which machine best fits your needs as no one machine is going to satisfy everybody’s requirements. So let’s do a run-down on this Omega J8006. Its black and chrome finish looks very clean and businesslike and it’ll most likely match your other kitchen appliances (unless you’re into a really whacky color schemes). You’re going to have to give over a sizeable chunk of countertop real estate to accommodate its 14.5 x 6.5 x 15.5 inch bulk. An option would be to store it in a pull-out cabinet as, at 17 pounds, it’s a heavy piece of kit to keep lifting and moving around. The size and weight make it a very stable machine when the powerful motor is doing its thing. The Omega J8006 features a dual-stage juicing system that thoroughly munches the raw plant fibers getting the most beneficial elements out of them before passing them through to the auto pulp-ejection department. And that’s what we like – goodness in the glass not in the pulp! 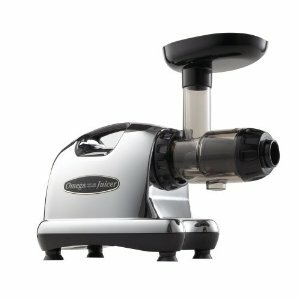 The Omega J8006 is a masticating juicer meaning that it chews the ingredients up just as we all do when eating food. Its powerful motor turns the blades at just 80 rpm efficiently ‘munching’ the fruit and veg to extract the maximum from every part of the plant. At that slow speed virtually no foam is generated and no heat either to compromise the juice quality. The feed tube is just 1 inch diameter so ingredients have to be chopped and sliced to be fed into the machine. So preparation time is greater than the Breville 800JEXL where whole items can be dropped into its 3 inch feed tube. But MojoJojo doesn’t mind – see the comment she left on Amazon. The Omega is able to turn out more than just juice. Try sorbets and nut butters for instance! Considering the powerful motor you could expect it to be a noisy beast. Truth is however, the unit runs very quietly, at a level equivalent to low-speed on an electric hand mixer. The slow turning speed, heavy construction and stability of the Omega J8006 all contribute to its quiet operation. Omega J8006 Nutrition Center is an easy machine to clean. No screws involved, there are just 5 easily disassembled, easy clean parts to be washed off. Do wash these components off by hand using the brush supplied preferably immediately after use before the juice and fiber begin to dry out. That applies to any machine. This machine will extract virtually every last drop out of the produce you feed it including the fibrous veggies. It juices broad leaf vegetables like cabbage, kale, spinach and broccoli tops extremely well and is a great machine for anyone following a living and raw food diet. Since the Omega runs at only 80 rpm the juice is foam-free and its low running temperature ensures the juices retain the best of their vitamins and enzymes. The Omega J8006 is not inexpensive. But it is a robust, powerful machine with an impressive 15 year manufacturer’s guarantee. The price compares favorably with similar quality juicers and it’ll deal effectively with almost anything it’s asked to do. It can deal with frozen fruit sorbets, nut butter and baby foods too so that’s an added bonus. For those who are into their juicing this will give value for the money and earn its kitchen space. Design and Dimensions: A powerful, well designed and built machine that does its job very effectively. Its size and weight dictate that is should ideally be given a permanent place on your countertop ready for action. Performance and Noise: Juice extraction is very good and the Omega certainly handles fibrous and leafy ingredients very well. Added bonus in its ability to produce sorbets, nut butters and baby food too. Neat touch! The small diameter feed tube does increase the time spent in juicing as fruit and vegetables have to be cut-up before insertion. Noise level is surprisingly low level considering the commercial grade motor. Cleaning: Easy peasy. Simply dismantle into five parts and manually wash. Cost: Considering its construction, power and versatility, not to mention the 15 year guarantee, the price buys confidence and peace-of-mind. The Omega J8006 price tag is similar to the Breville 800JEXL although some of its parts are of plastic compared to Breville’s stainless steel components. That said, the Omega has the added ability to produce homogenized foods. A great machine for those following a living and raw food diet. There’s a saving of $90 right now and shipping’s free. 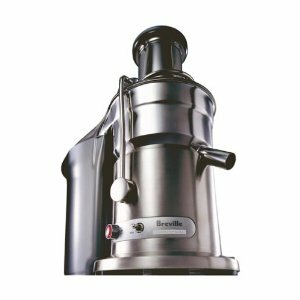 The Breville 800JEXL Juice Fountain Elite 1000-Watt Juice Extractor could easily be seen as the cream of the crop – the Rolls Royce of juicers. Its performance is top notch with styling to match. This is an appliance that you’ll be very happy to display for all to see. The Breville’s attractive stainless steel body will take up 17 x 11 inches of your worktop and weighs in at around 9 pounds. Its design is clean and modern and everything about it exudes its high tech credentials. An intelligent chip varies the motor power when it’s under load to maintain consistent speed. Now that’s impressive! The circular feed tube is a useful 3 inches in diameter allowing whole fruit and vegetables to be fed directly into the machine instead of having to cut them up first so large volumes of juice can be produced quickly. Your fruit and veg ingredients feed directly onto a titanium coated cutting disk and are quickly dealt with by 115 dual-action knives. A large capacity (34oz) juicing pitcher is supplied as part of the pack. It has a pouring spout and its lid skims the foam from the juice as you pour so what you’ll taste from your glass will be pure juice. The whole thing can be be quickly disassembled for easy cleaning. This Breville 800 JEXL is a centrifugal juicer. That all sounds all very technical but just means that it spins at high speed. Driven by a powerful 1000 watt motor it can be set to run at two speeds depending on what you’re juicing. High speed is a whopping 13,000 rpm used for harder produce and 6,500 rpm for soft fruit. That high speed is probably 3 times the speed of many other juicers so it’s going to be noisier than others too. But the power of the Breville means that it gets to work quickly making your juicing life a whole lot easier. All the pulp is filtered out by a fine, stainless steel mesh and before you know it you’ve switched the machine off and you’re savoring that delicious fresh juice. As a guide, it takes about five seconds to run up a standard 8 oz glass of apple juice. The speed of the machine and it’s efficient filter mean that the juice is clear and pulp-free. Short work can be made of soft fruit and veg like tomatoes and bananas on the quiet, low speed setting. There are no fiddly screws to be dealt with when disassembling the machine. Flip open the clip and the whole thing opens up. There are just four parts to be washed out or popped into the dishwasher. Being stainless steel, staining doesn’t present a problem. Clean up – job done. A word to the wise. Do the wash out straight after juicing before juices begin to dry off. That goes for ANY juicer. Just how much juice the Breville 800JEXL can extract depends on the fruit and vegetables being juiced however, you can be pretty sure that the power of this machine will produce the maximum volume possible. It’s a safe bet that you’ll use less fruit to produce the same amount of juice compared with many juicers you may have used in the past. And there’s no need for brute strength to force-feed your ingredients either. Even fibrous items like celery aren’t going to stick in the feed tube. Some say that high speed spinning has a tendency to oxidize the juice but users claim to be quite happy with their results. They detected none of that ‘tinnie’ taste in the flavor. The juicer works so quickly and efficiently that the juice will be fresher than with slower process juicers. As always, you get what you pay for and the Breville 800 is the juicer that juice enthusiasts seem to graduate to. If you’re a regular juice fanatic then this machine is certainly worth the investment. This juicer has been given 4.6 out of 5 stars by hundreds of users. This Amazon comment by cdesai82 is typical. Design and Dimensions: Clean and modern design which would enhance any kitchen but it might be a bit too large to be accommodated in a small apartment style kitchen. Performance and Noise: Fast! It’s quick and easy to load whole fruit and vegetables through the 3 inch feed tube and the cutting disk and knives makes short work of juicing them up. Yup – it’s louder than many other juicers but it is a powerful machine that makes short work of juicing fruit and veg. Cleaning: Simple. Clip open and all the disassembled parts can be put in the dishwasher. Volume and Taste: Probably produces a greater volume than most juicers and the taste is clean and fresh. Cost: Yes – it’s expensive. But if you are a fresh juice aficionado it’s worth the expense.